This machine measures the tightening torque on thread tightening, axial tension, torque on thread part to analyze features of tightening from various aspects. Tightening length is to be set by the thickness of spacer provided. Ex.) M10 Min.tightening length is 23mm, the total tightening length would be 33mm by putting a 10mm spacer. 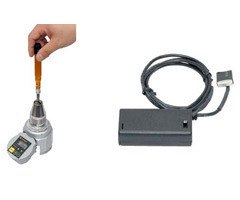 Torque strain gauge type converter measures total torque value, threaded portion torque, axial tension and turning rotation are measured by encoder. The converter for measuring axial tension and that of thread portion torque are based on the common composition of strain generating part. Calibration is not possible with the thread tightening tester installed. Take out the total torque converter, axial tension/screw torque converter from the machine and calibrate by each converter. As the turning angle and rotation speed for the tightening drive are obtained to count pulse from encoder, calibration of turning angle and rotation speed are not possible.